Tony and I will both be appearing at the Pritzker Military History Library on February 9th, 2006. We will be discussing the historiography of the battle, among other things. If you're in Chicago or the surrounding area, we hope to see you there! I just returned from the U.S. Naval War College, where I lectured for their Pacific War History elective. It was a great time, and everyone seems to have been well pleased with the results. I will be appearing at the Fort Snelling WWII Military History Roundtable in Minneapolis, on December 8th, 7:00PM. I will be selling autographed copies in the lobby. Shattered Sword is now shipping everywhere, and should be generally available. It's here! 70 copies of the book walked into my office this morning. It should begin shipping to bookstores later this week. I think the book looks great  the paper is a beautiful, bright white stock; the graphics are nice, and there's "thud factor" aplenty! I think anyone who buys it will feel that they're getting a good value for their money! Thanks for everyone who has supported us along the way! I now have the galley of the book in my hand, and it looks c o o o o l. I hate to say it, but I do nice work. It's going on the press in about two weeks, and will be released in late October/early November. The book is now for sale on a number of online stores, and will (of course) be available at your favorite local bookstores. Well, the book is now completely indexed (what a big job) and typeset. I am waiting for the final proof edits to come back from Potomac, but from what I am hearing from my production editor on that end, there's not much to do--the manuscript is very clean. So, after that we just have to hammer down the last little items, and then this thing goes to press! Woo hoo! Also, the Introduction is now up on this site, so you can take a look at what you're going to get. Likewise, I just found out yesterday from a friend in the UK that we're already up on Amazon.com! I have to admit that I'm pretty stoked to see that. We're getting closer to making this a reality all the time! as I get the okey-dokey, I will be posting the Introduction to Shattered Sword here on the web site. So, you probably already guessed that Shattered Sword is going to be a big book. Yet, we still want it to be affordable (i.e. a price tag of under $40.00). In an effort to keep Shattered Sword's cost to a minimum, I have reached a somewhat unusual agreement with Potomac Books, Inc. Instead of their internal production department laying out and typesetting the book, I am going to be taking on those duties. I have Adobe InDesign, and some background in desktop publishing in times past, so it's my baby now. Wish me luck! We've gotten a very favorable reaction to this page, with lots of people signing up. I've tried to answer as many emails as I can, but it can be a daunting task. Also, as soon as the book's Introduction makes it through copy-editing, we will be posting it here on the site. This will help people get a taste for the book, as well as some of the issue's we'll be tackling. So check back from time to time. I'll be emailing the list to let folks know when it's been posted, of course. We are pleased to announce that Potomac Books, Inc. (formerly Brasseys) has signed a deal with us for publication of Shattered Sword, scheduled for the fall of 2005. We couldn't be happier with having reached an agreement with Potomac Books, Inc., as they have a very well-established reputation for excellence in the field of military history. Tony and I are pleased to announce that we have secured the services of Mr. James Hornfischer, a noted literary agent. Jim has represented a number of very succesful authors, and has represented several NY Times non-fiction bestsellers. You can visit Jim's site by clicking here. We are thrilled to be working with Jim, not only because of his professional reputation, but also because of his genuine love of naval history. Jim is currently working on a forthcoming book of his own on the Battle of Leyte Gulf. The manuscript is about seventy-five percent complete at this point. Many of the illustrations are completed as well. Still working on tracking down the photos, though--that's going to be tough. 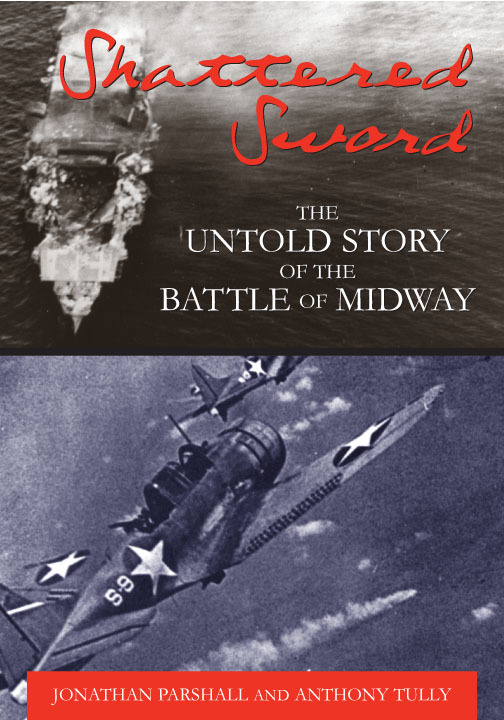 But we're determined to have more than the same old photographs you've already seen in other Midway books.